People often ask what hiking clothing or gear I can’t do without. Trekking poles are always on the top on my list. I can’t quite remember why I first bought a pair. But it was sometime after a hiking companion raved about them while we were gamboling around the hilly English countryside back in 2008. She had injured one of her knees, and said they were great because they took quite a bit of pressure off of that part of your body. My knees were just fine, though, so I thought they’d be overkill for a healthy, fit person. But in 2009, after hiking a portion of the Camino de Santiago (Vía de la Plata), I purchased a pair. Why? Everyone on the Camino had them. And I guess I wanted to fit in. That was a silly reason to purchase them, but I’m glad I did. For it was love at first step. They take pressure off of your lower extremities, as studies (and experience) show. Poles help you gauge the depth of puddles/streams/rivers. Trekking poles help with balance. Poles keep your arms/hands parallel to the ground as you hike, which greatly reduces swelling in your hands and fingers, especially when it’s warm out. This is one of their greatest, unheralded benefits. If you’re into ultralight backpacking, they can be used to help create your shelter. The downsides? Just as with anything, there are a few. They’re one more thing to keep track of. And sometimes you need your hands for something else, like holding an umbrella. But the pros clearly beat out the cons. So which poles are best? I started out with a mid-level pair from REI with cork handles and two adjustable segments. Back when I got them (around 2010), they were about $80. That pair lasted for some 6,000 miles of hiking. I still have them, actually; the only thing that’s gone wrong over the years is that the adjustable segments sometimes collapse while I’m hiking and need to be re-tightened with a screwdriver. 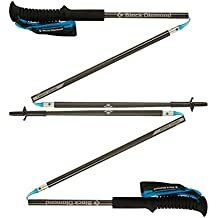 This spring I upgraded to these Black Diamond Distance Carbon Z Trekking Poles. I paid $169 for them, and as of this blog post they’re on sale (must be closing out). They’re worth the extra money because they’re made of carbon fiber, so they’re very strong, yet lightweight (just 9-10 ounces). And their unique, three-section foldable design means they snap open and closed easily with no need to constantly re-configure the height for your body. Take a tiny screwdriver and stick it into the little plug where the strap cord goes through the handle. Either side is fine. The cord goes into the plug through a slit; turn the slit with the screwdriver so the slit is parallel with the top of the grip. This will enable you to push the plug part-way out the other side. Slide off the old strap and slide on the new one. Now turn the open side of the plug’s slit so it is facing UP. Put the end of the cord inside and slide it back into the handle. This part takes some dexterity. The cord won’t go in cleanly. You have to set it in the plug as best as you can and push the plug back inside, which sort of forces the cord into the plug. Take the screwdriver and turn the plug’s slit so it is perpendicular to the top of the grip. You’re finished!